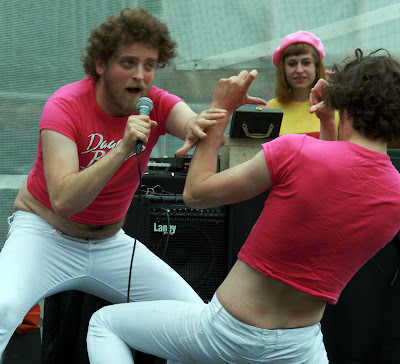 The Dagger Brothers singing Paparazzi during the four day long Tate festival over bank holiday weekend. A bit of sun, a few days holiday and Londoners will show you how to have fun no matter how old or young. A sprinkling of madness definitely helps. Nice picture, I like the movement in it! I miss the tate modern events this weekend but it looks like it was a lot of fun! Just love the expression on his face. A lot more going on than just singing! He does look to be working hard judging by his colouring! Shame they could not afford more material for their tops ... to cover all that hairy flab would be good!! They seem to have had more than a sprinkle of madness! Looks fun! Are they good singers ? They really look like they are having great fun! What about their singing? Is Paparazzi the title of their song or part of the name of the band? Never mind! It's not so important. You caught the exact mood of the action. Excellent! Seems to have been a nice event! Looking forward to our "Fête de la Musique", June 21!